McGill University (French: Université McGill) is a public research university in Montreal, Quebec, Canada. It was established in 1821 by royal charter, granted by King George IV. The university bears the name of James McGill, a Montreal merchant originally from Scotland whose bequest in 1813 formed the university's precursor, McGill College. McGill's main campus is at Mount Royal in downtown Montreal, with the second campus situated in Sainte-Anne-de-Bellevue, also on the Montreal Island, 30 kilometres (18 miles) west of the main campus. The university is one of two universities outside the United States who are members of the Association of American Universities and it is the only Canadian member of the Global University Leaders Forum (GULF) within the World Economic Forum. McGill offers degrees and diplomas in over 300 fields of study. Most students are enrolled in the five largest faculties, namely Arts, Science, Medicine, Engineering, and Management. McGill counts among its alumni 12 Nobel laureates and 145 Rhodes Scholars, both the most of any university in Canada, as well as five astronauts, the incumbent prime minister and two former prime ministers of Canada, the incumbent Governor General of Canada, 14 justices of the Canadian Supreme Court, at least eight foreign leaders, 28 foreign ambassadors, over eight dozen members of the Canadian Parliament, United States Congress, British Parliament, and other national legislatures, several billionaires, nine Academy Award (Oscars) winners, 11 Grammy Award winners, four Pulitzer Prize winners, two Presidential Medal of Freedom recipients,[note 1] at least 16 Emmy Award winners,[note 2] and 28 Olympic medalists, all of varying nationalities. McGill University or its alumni founded several major universities and colleges, including the University of British Columbia, the University of Victoria, the University of Alberta, the Schulich School of Medicine & Dentistry at the University of Western Ontario, the Johns Hopkins University School of Medicine, and Dawson College. The Royal Institution for the Advancement of Learning (RIAL) was created in 1801 under an Act of the Legislative Assembly of Lower Canada, An Act for the establishment of Free Schools and the Advancement of Learning in this Province. In 1816 the RIAL was authorized to operate two new Royal Grammar Schools, in Quebec City and in Montreal. This was a turning point for public education in Lower Canada as the schools were created by legislation, the District Public Schools Act of 1807, which showed the government's willingness to support the costs of education and even the salary of a schoolmaster. This was an important first step in the creation of nondenominational schools. When James McGill died in 1813 his bequest was administered by the RIAL. Of the original two Royal Grammar Schools, in 1846 one closed and the other merged with the High School of Montreal. By the mid-19th century the RIAL had lost control of the other eighty-two grammar schools it had administered. However, in 1853 it took over the High School of Montreal from the school's board of directors and continued to operate it until 1870. Thereafter, its sole remaining purpose was to administer the McGill bequest on behalf of the private college. The RIAL continues to exist today; it is the corporate identity that runs the university and its various constituent bodies, including the former Macdonald College (now Macdonald Campus), the Montreal Neurological Institute, and the Royal Victoria College (the former women's college turned residence). Since the revised Royal Charter of 1852, The Trustees of the RIAL comprise the Board of Governors of McGill University. 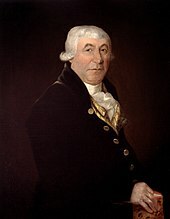 James McGill, the original benefactor of McGill University. James McGill, born in Glasgow, Scotland on 6 October 1744, was a successful merchant in Quebec, having matriculated into the University of Glasgow in 1756. Soon afterwards, McGill left for North America to explore the business opportunities there. Between 1811 and 1813, he drew up a will leaving his "Burnside estate", a 19-hectare (47-acre) tract of rural land and 10,000 pounds to the Royal Institution for the Advancement of Learning. On McGill's death in December 1813, the Royal Institution for the Advancement of Learning, established in 1801 by an Act of the Legislative Assembly of Lower Canada, added the establishing of a University pursuant to the conditions of McGill's will to its original function of administering elementary education in Lower Canada. As a condition of the bequest, the land and funds had to be used for the establishment of a "University or College, for the purposes of Education and the Advancement of Learning in the said Province." The will specified a private, constituent college bearing his name would have to be established within 10 years of his death; otherwise the bequest would revert to the heirs of his wife. On March 31, 1821, after protracted legal battles with the Desrivières family (the heirs of his wife), McGill College received a royal charter from King George IV. The Charter provided the College should be deemed and taken as a University, with the power of conferring degrees. Although McGill College received its Royal Charter in 1821, it was inactive until 1829 when the Montreal Medical Institution, which had been founded in 1823, became the college's first academic unit and Canada's first medical school. The Faculty of Medicine granted its first degree, a Doctorate of Medicine and Surgery, in 1833; this was also the first medical degree to be awarded in Canada. The Faculty of Medicine remained the school's only functioning faculty until 1843, when the Faculty of Arts commenced teaching in the newly constructed Arts Building and East Wing (Dawson Hall). The university also historically has strong links with the Canadian Grenadier Guards, a military regiment in which James McGill served as Lieutenant-Colonel. This title is marked upon the stone that stands before the Arts building, from where the Guards step off annually to commemorate Remembrance Day. The Faculty of Law was founded in 1848 and is also the oldest of its kind in the nation. 48 years later, the school of architecture at McGill University was founded. 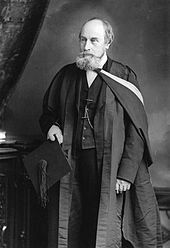 Sir John William Dawson, McGill's principal from 1855 to 1893, is often credited with transforming the school into a modern university. He recruited the aid of Montreal's wealthiest citizens (eighty percent of Canada's wealth was then controlled by families who lived within the Golden Square Mile area that surrounded the university), many of whom donated property and funding needed to construct the campus buildings. Their names adorn many of the campus's prominent buildings. William Spier designed the addition of West Wing of the Arts Building for William Molson, 1861. Alexander Francis Dunlop designed major alterations to the East Wing of McGill College (now called the Arts Building, McGill University) for Prof. Bovey and the Science Dept., 1888. This expansion of the campus continued until 1920. Buildings designed by Andrew Taylor, include the Redpath Museum (1880), Macdonald Physics Building (1893), the Redpath Library (1893), the Macdonald Chemistry Building (1896), the Macdonald Engineering Building (1907)—now known as the Macdonald-Stewart Library Building, and the Strathcona Medical Building (1907)—since renamed the Strathcona Anatomy and Dentistry Building. In 1900, the university established the MacLennan Travelling Library. McGill University Waltz composed by Frances C. Robinson, was published in Montréal by W.H. Scroggie, c 1904. In 1885, the university's Board of Governors formally adopted the use of the name "McGill University". In 1905, the university acquired a second campus when Sir William C. Macdonald, one of the university's major benefactors, endowed a college in Sainte-Anne-de-Bellevue, 32 kilometres west of Montreal. Macdonald College, now known as the Macdonald Campus, opened to students in 1907, originally offering programs in agriculture, household science, and teaching. George Allan Ross designed the Pathology Building, 1922–23; the Neurological Institute, 1933; Neurological Institute addition 1938 at McGill University. Jean Julien Perrault (architect) designed the McTavish Street residence for Charles E. Gravel, which is now called David Thompson House (1934). Women's education at McGill began in 1884, when Donald Smith (later the Lord Strathcona and Mount Royal), began funding separate lectures for women, given by university staff members. The first degrees granted to women at McGill were conferred in 1888. In 1899, the Royal Victoria College (RVC) opened as a residential college for women at McGill with Hilda D. Oakeley as the head. Until the 1970s, all female undergraduate students, known as "Donaldas," were considered to be members of RVC. Beginning in the autumn of 2010, the newer Tower section of Royal Victoria College is a co-ed dormitory, whereas the older West Wing remains strictly for women. Both the Tower and the West Wing of Royal Victoria College form part of the university's residence system. The Second University Company prior to their departure for France. McGill University played a significant role in The Great War. Many students and alumni enlisted in the first wave of patriotic fervor that swept the nation in 1914, but in the spring of 1915—after the first wave of heavy Canadian casualties at Ypres—Hamilton Gault, the founder of the Canadian regiment and a wealthy Montreal businessman, was faced with a desperate shortage of troops. When he reached out to his friends at home for support, over two hundred were commissioned from the ranks, and many more would serve as soldiers throughout the war. On their return to Canada after the war, Major George McDonald and Major George Currie formed the accounting firm McDonald Currie, which later became one of the founders of Price Waterhouse Coopers. Captain Percival Molson was killed in action in July 1917. Percival Molson Memorial Stadium at McGill is named in his honour. The War Memorial Hall (more generally known as Memorial Hall) is a landmark building on the campus of McGill University. At the dedication ceremony the Governor General of Canada (Harold Alexander, 1st Earl Alexander of Tunis) laid the cornerstone. Dedicated on October 6, 1946, the Memorial Hall and adjoining Memorial Pool honour students who had enlisted and died in the First World War, and in the Second World War. In Memorial Hall, there are two Stained Glass Regimental badge World War I and World War II Memorial Windows by Charles William Kelsey c. 1950/1. A war memorial window (1950) by Charles William Kelsey in the McGill War Memorial Hall depicts the figure of St. Michael and the badges of the Navy, Army and the Air Force. 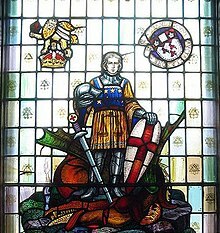 A Great War memorial window featuring Saint George and a slain dragon at the entrance to the Blackader-Lauterman Library of Architecture and Art is dedicated to the memory of 23 members of the McGill Chapter of Delta Upsilon who gave their lives in the Great War. Six other windows (1951) by Charles William Kelsey on the west wall of the memorial hall depict the coats of arms of the regiments in which the McGill alumni were members. There is a memorial archway at Macdonald College, two additional floors added to the existing Sir Arthur Currie gymnasium, a hockey rink and funding for an annual Memorial Assembly. A Book of Remembrance on a marble table contains the names of those lost in both World Wars. On 11 November 2012 the McGill Remembers web site launched; the University War Records Office collected documents between 1940 and 1946 related to McGill students, staff and faculty in the Second World War. Beginning in the 1920, and continuing until the 1960s, McGill imposed a controversial quota which specified a maximum on the proportion of newly admitted students who were Jewish. The quota limited the Jewish population across McGill to at most 10%. McGill was instrumental in founding several major universities and colleges. It established the first post-secondary institutions in British Columbia to provide degree programs to the growing cities of Vancouver and Victoria. It chartered Victoria College in 1903 as an affiliated junior college of McGill, offering first and second-year courses in arts and science, until it became today's University of Victoria. British Columbia's first university was incorporated in Vancouver in 1908 as the McGill University College of British Columbia. The private institution granted McGill degrees until it became the independent University of British Columbia in 1915. Dawson College began in 1945 as a satellite campus of McGill to absorb the anticipated influx of students after World War II. Many students in their first 3 years in the Faculty of Engineering took courses at Dawson College to relieve the McGill campus for the later two years for their degree course. Dawson eventually became independent of McGill and evolved into the first English CEGEP in Quebec. Another CEGEP, John Abbott College, was established in 1971 at the campus of McGill's Macdonald College. Both founders of the University of Alberta, Premier Alexander Cameron Rutherford of Alberta and Henry Marshall Tory, were also McGill alumni. In addition, McGill alumni and professors, Sir William Osler and Howard Atwood Kelly, were among the four founders and early faculty members of the Johns Hopkins University School of Medicine. Osler eventually became the first Physician-in-Chief of the new Johns Hopkins Hospital in Baltimore, Maryland, US in 1889. He led the creation of the Johns Hopkins University School of Medicine in 1893. Other McGill alumni founded the Schulich School of Medicine & Dentistry in the 1880s. The recently renovated McTavish Street is a critical artery connecting the lower campus to the upper campus. 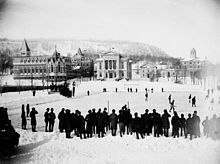 A hockey game on campus in 1884, just seven years after McGill students wrote the then-new game's first rule book, with the Arts Building, Redpath Museum, and Morrice Hall (then the Presbyterian College) visible. McGill's downtown campus at night viewed from Mount Royal. The circular building in the foreground is the McIntyre Medical Sciences Building. McGill's main campus is situated in downtown Montreal at the foot of Mount Royal. Most of its buildings are in a park-like campus (also known as the Lower Campus) north of Sherbrooke Street and south of Pine Avenue between Peel and Aylmer streets. The campus also extends west of Peel Street (also known as Upper Campus) for several blocks, starting north of Doctor Penfield; the campus also extends east of University Street, starting north of Pine Avenue, an area that includes McGill's Percival Molson Memorial Stadium and the Montreal Neurological Institute and Hospital. 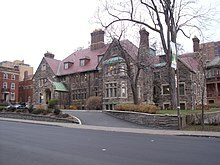 The community immediately east of University Street and south of Pine Avenue is known as the McGill Ghetto, where a large number of students reside. The campus is near the Peel and McGill Metro stations. A major downtown boulevard, McGill College Avenue, leads up to the Roddick Gates, the university's formal main entrance. All of the major university buildings were constructed using local grey limestone, which serves as a unifying element. The university's first classes were held in at Burnside Place, James McGill's country home. Burnside Place remained the sole educational facility until the 1840s, when the school began construction on its first buildings: the central and east wings of the Arts Building. The rest of the campus was essentially a cow pasture, a situation similar to the few other Canadian universities and early American colleges of the age. The university's athletic facilities, including Molson Stadium, are on Mount Royal, near the residence halls and the Montreal Neurological Institute. The Gymnasium is named in honour of General Sir Arthur William Currie. In 2012, Travel + Leisure rated McGill's campus as one of the 17 most beautiful university campuses in the world. This former mansion in the Tudor revival style was completed in 1926 and retains most of its original interiors, including ornate dark wood panelling with a decorative frieze. McGill's residence system houses approximately 3,100 undergraduate students and some graduate students. With the exception of students returning as "floor fellows" or "dons", few McGill students live in residence (known colloquially as "rez") after their first year of undergraduate study, even if they are not from the Montreal area. Most second-year students transition to off-campus apartment housing. Many students settle in the "McGill Ghetto", alternatively known as the Milton-Park community, the neighbourhood directly to the east of the downtown campus. In recent years, students have begun moving out to other areas such as Mile End, The Plateau, and even as far as Verdun because of rising rent prices. Many first-year students live in the Bishop Mountain Residences ("Upper Rez"), a series of concrete dormitories on the slope of Mount Royal, consisting of McConnell Hall, Molson Hall, Gardner Hall, and Douglas Hall. McGill's largest residence is New Residence Hall ("New Rez"), a converted four-star hotel a few blocks east of campus at Park Avenue and Prince Arthur. It houses approximately 700 students each year. Solin Hall, near Lionel-Groulx station, is McGill's second largest residence, housing roughly 300 students. Carrefour Sherbrooke Residence Hall was opened in 2009 on 475 Sherbrooke Street West, previously the Four Points Sheraton Hotel. 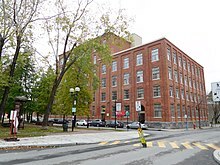 In 2012, McGill opened La Citadelle, a converted hotel residence housing 286 students on Sherbrooke Street West at the corner of Hutchinson. Royal Victoria College, once a women-only dormitory, became co-ed in September 2010. The college's original building was designed by Bruce Price and its extension was designed by Percy Erskine Nobbs and George Taylor Hyde. Erected in front of the Royal Victoria College is a statue of Queen Victoria by her daughter Princess Louise, Duchess of Argyll. Solin Hall, situated in Saint-Henri near Lionel-Groulx station, serves as an off-campus apartment style dorm. Among the McGill Off-Campus Residence Experience buildings are Presbyterian Hall ("Pres Rez"), adjacent to the Presbyterian College, and University Hall (also known as "Dio"), adjacent to the Montreal Diocesan Theological College. Greenbriar Hall houses 89 students. Other buildings included in the McGill Off-Campus Residence Experience are on Peel Street, University Street, and Pine Avenue, however, the university has begun to sell off buildings and only University Hall and some Pine Avenue houses are left. A second campus, the Macdonald Campus, in Sainte-Anne-de-Bellevue houses the Faculty of Agricultural and Environmental Science, the School of Dietetics and Human Nutrition, the Institute of Parasitology, and the McGill School of Environment. The Morgan Arboretum and the J. S. Marshall Radar Observatory are nearby. The Morgan Arboretum was created in 1945. It is a 2.5-square-kilometre (0.965 sq mi) forested reserve with the aim of 'teaching, research, and public education'. Its mandated research goals are to continue research related to maintaining the health of the Arboretum plantations and woodlands, to develop new programs related to selecting species adapted to developing environmental conditions and to develop silvicultural practices that preserve and enhance biological diversity in both natural stands and plantations. In 2006, the Quebec government initiated a $1.6 billion LEED redevelopment project for the McGill University Health Centre (MUHC). The project will expand facilities to two separate campuses and consolidate the various hospitals of the MUHC on the site of an old CP rail yard adjacent to the Vendôme Metro station. This site, known as Glen Yards, comprises 170,000 square metres (1,800,000 sq ft) and spans portions of Montreal's Notre-Dame-de-Grâce neighbourhood and the city of Westmount. The Glen Yards project has been controversial due to local opposition to the project, environmental issues, and the cost of the project itself. The project, which has received approval from the provincial government, was, in 2003, expected to be complete by 2010. The new 'campus' has now been completed, and a massive effort of moving units from older hospitals, such Royal Victoria, Montreal Children's, and Montreal General, into the new McGill University Health Center is underway. In 2007, McGill premiered its Office of Sustainability and added a second full-time position in this area, the Director of Sustainability in addition to the Sustainability Officer. Recent efforts in implementing its sustainable development plan include the new Life Sciences Center which was built with LEED-Silver certification and a green roof, as well as an increase in parking rates in January 2008 to fund other sustainability projects. Other student projects include The Flat: Bike Collective, which promotes alternative transportation, and the Farmer's Market, which occurs during the fall harvest. The Farmer's Market and many other initiatives came out of student collaboration during the Rethink Conference 2008. McGill's Bellairs Research Institute, in Saint James, Barbados 13°10′N 59°35′W﻿ / ﻿13.167°N 59.583°W﻿ / 13.167; -59.583, is Canada's only teaching and research facility in the tropics. The institute has been in use for over 50 years. The University also operates the McGill Arctic Research Station on Axel Heiberg Island, Nunavut, and a Subarctic Research Station in Schefferville, Quebec. The laboratories of the Huntsman Marine Science Centre are in St. Andrews, N.B., on 300,000 square metres (3,200,000 sq ft) of land at the estuary of the St. Croix River. It hosts the Atlantic Reference Centre, which is known throughout the Maritimes for its extensive marine biology collections. The HMS is a research facility "committed to the advancement of the marine sciences through basic and applied research" and acts as a field facility for research and teaching by McGill and other member universities. Parc Rutherford at night. The Genome Building (left), Wong Building (middle), and McTavish Reservoir (right) are seen in the background. McGill's Gault Nature Reserve (45°32′N 73°10′W﻿ / ﻿45.533°N 73.167°W﻿ / 45.533; -73.167) spans over 10 square kilometres (3.9 sq mi) of forest land, the largest remaining remnant of the primeval forests of the St. Lawrence River Valley. The first scientific studies at the site occurred in 1859. The site has been the site of extensive research activities: "Today there are over 400 scientific articles, 100 graduate theses, more than 50 government reports and about 30 book chapters based on research at Mont St. Hilaire." 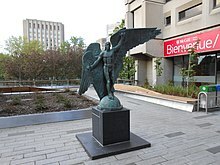 In addition to the McGill University Health Centre, McGill has been directly partnered with many teaching hospitals for decades, and also has a history of collaborating with many hospitals in Montreal. These cooperations allow the university to graduate over 1,000 students in health care each year. 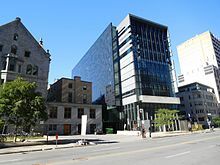 McGill's contract-affiliated teaching hospitals include the Montreal Children's Hospital, the Montreal General Hospital, the Montreal Neurological Hospital, the Montreal Chest Institute and the Royal Victoria Hospital which are all now part of the McGill University Health Centre. Other hospitals health care students may use include the Jewish General Hospital, the Douglas Hospital, St. Mary's Hospital Center, Lachine Hospital, LaSalle Hospital, Lakeshore General Hospital, as well as health care facilities part of the Centre intégré de santé et services sociaux de l'Outaouais. In 2019, McGill announced the construction of a new Faculty of Medicine campus in the Outaouais region, which will run the undergraduate medical education program in French and allow students to complete their medical training entirely in the Outaouais. The new facility will be erected above the emergency room at the Gatineau Hospital, in addition to new offices for the associated Family Medicine Unit for residency training. Although the undergraduate medical education program will be offered, students entering the program from CEGEP will have to complete a preparatory year only offered at the McGill downtown campus in Montreal. Until the late 19th century, McGill had also owned parkland atop the Westmount Summit, which was used as a botanical garden. In the early twentieth century, McGill donated the land to the City of Westmount on the condition it become a bird sanctuary. In 1998, the Faculty of Management launched their MBA Japan program, the first Canadian degree program offered in Japan, with teaching facilities at Nishi-Shinjuku, Tokyo. The University's academic units are organized into 11 main Faculties and Schools. These include the School of Architecture, the School of Computer Science, the School of Information Studies, the School of Dietetics and Human Nutrition, the School of Physical & Occupational Therapy, the Ingram School of Nursing, the School of Social Work, the School of Urban Planning, and the McGill School of Environment. They also include the Institute of Islamic Studies (established in 1952) which offers graduate courses leading to the M.A. and PhD degrees, and covering the history, culture, and civilization of Islam; the Institute is also served by one of the richest libraries in North America on Islamic studies. The Graduate and Postdoctoral Studies (GPS) oversees the admission and registration of graduate students (both master's and PhD). The GPS administers graduate fellowships, postdoctoral affairs, and the graduation process, including the examination of theses. In conjunction with other units, it conducts regular program reviews in all study disciplines. Founded in 1956, the McGill Executive Institute provides business seminars and custom executive education to companies, government services and non-profit organizations. Led primarily by McGill faculty, the executive courses and management training programs are designed for all managerial levels, from board members to senior-level executives to junior managers. 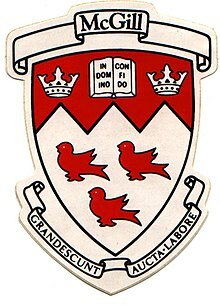 The McGill coat of arms is derived from an armorial device assumed during his lifetime by the founder of the University, James McGill. The University's patent of arms was granted by the Garter King at Arms in 1922, registered in 1956 with Lord Lyon King of Arms in Edinburgh, and in 1992 with the Public Register of Arms, Flags and Badges of Canada. In heraldic terms, the coat of arms is described as follows: "Argent three Martlets Gules, on a chief dancette of the second, an open book proper garnished or bearing the legend In Domino Confido in letters Sable between two crowns of the first. Motto: Grandescunt Aucta Labore." The coat of arms consists of two parts, the shield and the scroll. The University publishes a guide to the use of the University's arms and motto. The University's symbol is the martlet, stemming from the presence of the mythical bird on the official arms of the university. The university's official colour is scarlet, which figures prominently in the academic dress of McGill University. 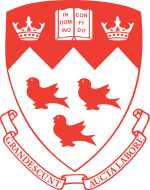 McGill's motto is Grandescunt Aucta Labore, Latin for "By work, all things increase and grow" (literally, "Things grown great increase by work," that is, things that grow to be great do so by means of work). The official school song is entitled "Hail, Alma Mater." As a public university, McGill is not as dependent on its endowment for operating revenue as some of its international peers. The McGill endowment only provides approximately 10 per cent of the school's annual operating revenues. Nonetheless, McGill's endowment rests within the top 10 percent of all North American post-secondary institutions' endowments. While McGill's conservative investment policy has protected it from the more substantial losses experienced at many other universities during the market crisis of 2008–2009, it still faced a 20% endowment decline from approximately $920 million to $740 million. The endowment subsequently recovered and is now valued at $1.65 billion, the second-largest in Canada and, at $41,323 per student, the largest among Canadian universities on a per-student basis. McGill launched the Campaign McGill comprehensive campaign in October 2007, with the goal of raising over $750 million for the purpose of further "attracting and retaining top talent in Quebec, to increase access to quality education and to further enhance McGill's ability to address critical global problems." The largest goal of any Canadian university fundraising campaign in history, within the first six months, McGill had accumulated over $400 million towards its efforts. The campaign was officially closed on 18 June 2013. The university surpassed its initial goal of $750 million and raised more than $1 billion. McGill is also the recipient of the largest single philanthropic gift in Canadian history, a $200 million donation to fund the creation of the McCall MacBain Scholarships programme. Twenty-two percent of all students are enrolled in the Faculty of Arts, McGill's largest academic unit. Of the other larger faculties, the Faculty of Science enrolls 15%, the Faculty of Medicine enrolls 13%, the School of Continuing Studies enrolls 12%, the Faculty of Engineering and the Desautels Faculty of Management enroll about 10% each. The remainder of all students are enrolled in McGill's smaller schools, including the Faculty of Agricultural and Environmental Sciences, Faculty of Dentistry, Faculty of Education, Faculty of Law, Schulich School of Music, and the Faculty of Religious Studies. Since the 1880s, McGill has been affiliated with three Theological Colleges; the Montreal Diocesan Theological College (Anglican Church of Canada), The Presbyterian College, Montreal (Presbyterian Church in Canada), and United Theological College (United Church of Canada). The university's Faculty of Religious Studies maintains additional affiliations with other theological institutions and organizations, such as the Montreal School of Theology. In 2018, the university offered admission to 15,986 students out of a total of 38,320 undergraduate applicants with 6,422 students enrolling. McGill students have the highest average entering grade of any Canadian university. Among admitted students, the median Quebec CEGEP R-score was 31.9, while the median grade 12 averages for students entering McGill from outside of Quebec ranged between 93.2% and 94.4% (A). For American students, the median SAT scores in the verbal, mathematics, and writing sections were 730, 730, and 730 respectively. The median ACT score was 32. Due to its bilingual nature, McGill's law school does not require applicants to sit the LSAT, which is only offered in English. For students who submitted LSAT scores in the September 2017 entering class the median LSAT score was 162 (86.8th percentile) out of a possible 180 points. Of those students who entered with a bachelor's degree the median GPA was 84%, and of those students entering from CEGEP the average R-score was 33.8. For medical students, the median undergraduate GPA was 3.83 out of 4.0. McGill does not require applicants to its medical programme to sit the MCAT if they have an undergraduate degree from a Canadian university. In the Desautels Faculty of Management's MBA program, applicants had an average GMAT score of 670 and an average GPA of 3.3. MBA students had an average age of 28, and five years of work experience. 95% of MBA students are bilingual and 60% are trilingual. In the 2007–2008 school year, McGill offered over 340 academic programs in eleven faculties. The university also offers over 250 doctoral and master's graduate degree programs. Despite strong increases in university enrollment across North America, McGill has upheld a relatively low and appealing student-faculty ratio of 16:1. There are nearly 1,600 tenured or tenure-track professors teaching at the university. Tuition fees vary significantly depending on the faculties that aspiring (graduate and undergraduate) students choose as well as their citizenship. For the undergraduate faculty of the arts, tuition fees vary for in-province, out-of-province, and international students, with full-time Quebec students paying around $4,333.10 per year, Canadian students from other provinces paying around $9,509.30 per year, and international students paying $22,102.57–$41,815.92 per year. Students must also pay housing costs, though Montreal has some of the least expensive housing among large North American cities. Since 1996, McGill, in accordance with the Quebec Ministry of Education, Recreation and Sports (Ministère de l'Éducation, du Loisir et du Sport or MELS), has had eight categories that qualifies certain international students to be excused from paying international fees. These categories include: students from France, a quota of students from select countries which have agreements with MELS, which include Algeria, China, and Morocco, students holding diplomatic status, including their dependents, and students enrolled in certain language programs leading to a degree in French. In the school year 2008–2009, McGill's graduate business program became funded by tuition, and was the last business school in Canada to do so. Scholarships at McGill are relatively difficult to attain, compared to other Canadian universities. For out-of-province first year undergraduate students, a high school average of 95% is required to receive a guaranteed one-year entrance scholarship. To be considered for the same scholarships, Quebec CEGEP students need a minimum R-score of 35.5, United States high school students need a minimum A average as well as at least 700 in each SAT or 33 in the ACT, and French Baccalaureate students need an average of 15.5 plus a minimum score of 14 in each course; similarly, students in the British education system need As in both GCSE Level and predicted Advanced Level results, and International Baccalaureate students need to attain a minimum overall average of 6.9 on predicted grades or a score of 42 on exam results. In general, entrance scholarship recipients rank in the top 1–2% of their class. For renewal of previously earned scholarships, students generally need to be within the top 10% of their faculty. For in-course scholarships in particular, students must be within the top 5% of their faculty. McGill itself outlines scholarship considerations as follows: "Competition for basic and major scholarships is intense at McGill. An extraordinary number of exceptional applications are received each year and therefore we cannot award scholarships to all good candidates." The university has joined Project Hero, a scholarship program cofounded by General (Ret'd) Rick Hillier for the families of fallen Canadian Forces members. McGill is also partnered with the STEM initiative Schulich Leader Scholarships, awarding an $80,000 scholarship to an incoming engineering student and a $60,000 scholarship to a student pursuing a degree in science/technology/mathematics each year. McGill is one of three English-language universities in Quebec; French is not a requirement to attend. The Faculty of Law does, however, require all students to be 'passively bilingual', meaning all students must be able to understand written and spoken French—or English if the student is Francophone—since English or French may be used at any time in a course. Over 40,000 students attend McGill, with international students comprising approximately 29 percent of the student population. The majority of students are fluent in at least two languages. Francophone students, whether from Quebec or overseas, now make up approximately 20 percent of the student body. Although the language of instruction is English, since its founding McGill has allowed students to write their thesis in French, and since 1964 students in all faculties have been able to submit any graded work in either English or French, provided the objective of the class is not to learn a particular language. The University has a bilingual language policy and charter. In 1969, the nationalist McGill français movement demanded McGill become francophone, pro-nationalist, and pro-worker. The movement was led by Stanley Gray, a political science professor (and possibly unaware of government plans after the recent (1968) legislation founding the Université du Québec) A demonstration was held of 10,000 trade unionists, leftist activists, CEGEP students, and even some McGill students, at the university's Roddick Gates on March 28, 1969. Protesters saw English as the privileged language of commerce. McGill, where Francophones comprised only three percent of the students, could be seen as the force maintaining economic control by Anglophones of a predominantly French-speaking province. However, the majority of students and faculty opposed such a position. Domestically, McGill is ranked joint 1st in Canada among medical-doctoral universities in the Maclean's University Rankings 2019, maintaining its 1st or joint 1st position for the 14th consecutive year. Internationally, McGill ranked 33rd in the world and 2nd in Canada in the 2019 QS World University Rankings. It was ranked 44th in the world and 3rd in Canada by the 2019 Times Higher Education World University Rankings and 70th in the world and 3rd in Canada by the Academic Ranking of World Universities (ARWU) 2018. Times Higher Education also ranked McGill 18th in the world and 2nd in Canada in its 2018 Global University Employability Ranking. Nature ranked McGill 70th in the world and 2nd in Canada among academic institutions for high-impact research in the 2018 edition of Nature Index. McGill is one of 26 members of the Global University Leaders Forum (GULF), which acts as an intellectual community within the World Economic Forum to advise its leadership on matters relating to higher education and research. It is the only Canadian university member of GULF. The Globe and Mail's Canadian University Report 2018 categorised McGill as "above average" for its bursaries and awards, research, and library resources, and as "average" for its student experience. The Financial Times, in its 2018 Global MBA ranking, placed Desautels Faculty of Management's MBA programme 78th in the world and 1st in Canada. The ranking placed it 55th and 43rd worldwide in the value for money and alumni recommended categories respectively. The Eduniversal Ranking placed the Desautels Faculty of Management of McGill University first in Canada among business schools. In BusinessWeek's Best International Business Schools ranking 2017, Desautels was ranked 28th among international (non-U.S.) business schools. Research Infosource ranked McGill 3rd among Canadian universities with medical schools in its 2018 edition of Research Universities of the Year, with McGill ranking 3rd in its category for research intensity per faculty and 4th for total research income. Research plays a critical role at McGill. McGill is affiliated with 12 Nobel Laureates and professors have won major teaching prizes. According to the Association of Universities and Colleges of Canada, "researchers at McGill are affiliated with about 75 major research centres and networks, and are engaged in an extensive array of research partnerships with other universities, government and industry in Quebec and Canada, throughout North America and in dozens of other countries." In 2016, McGill had over $547 million of sponsored research income, the second highest in Canada, and a research intensity per faculty of $317,600, the third highest among full-service universities in Canada. McGill has one of the largest patent portfolios among Canadian universities. McGill's researchers are supported by the McGill University Library, which comprises 13 branch libraries and holds over six million items. Since 1926, McGill has been a member of the Association of American Universities (AAU), an organization of leading research universities in North America. McGill is a founding member of Universitas 21, an international network of leading research-intensive universities that work together to expand their global reach and advance their plans for internationalization. McGill is one of 26 members of the prestigious Global University Leaders Forum (GULF), which acts as an intellectual community within the World Economic Forum to advise its leadership on matters relating to higher education and research. It is the only Canadian university member of GULF. McGill is also a member of the U15, a group of prominent research universities within Canada. McGill-Queen's University Press began as McGill in 1963 and amalgamated with Queen's in 1969. McGill-Queen's University Press focuses on Canadian studies and publishes the Canadian Public Administration Series. McGill is perhaps best recognized for its research and discoveries in the health sciences. Sir William Osler, Wilder Penfield, Donald Hebb, Brenda Milner, and others made significant discoveries in medicine, neuroscience and psychology while working at McGill, many at the University's Montreal Neurological Institute. The first hormone governing the Immune System (later christened the Cytokine 'Interleukin-2') was discovered at McGill in 1965 by Gordon & McLean. The invention of the world's first artificial cell was made by Thomas Chang while an undergraduate student at the university. 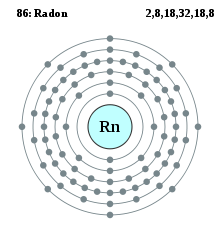 While chair of physics at McGill, nuclear physicist Ernest Rutherford performed the experiment that led to the discovery of the alpha particle and its function in radioactive decay, which won him the Nobel Prize in Chemistry in 1908. Alumnus Jack W. Szostak was awarded the 2009 Nobel Prize in medicine for discovering a key mechanism in the genetic operations of cells, an insight that has inspired new lines of research into cancer. William Chalmers invented Plexiglas while a graduate student at McGill. In computing, MUSIC/SP, software for mainframes once popular among universities and colleges around the world, was developed at McGill. A team also contributed to the development of Archie, a pre-WWW search engine. A 3270 terminal emulator developed at McGill was commercialized and later sold to Hummingbird Software. A team has developed digital musical instruments in the form of prosthesis, called Musical Prostheses. The McGill University Libraries. The McGill University Library includes 13 branches or subject libraries including the Department of Rare Books & Special Collections which holds about 350,000 items, including books, manuscripts, maps, prints, and a general rare book collection. The Osler Library of the History of Medicine is the largest medical history library in Canada and one of the most comprehensive in the world. The McGill University Archives – now administered as part of the McGill Library – houses official records of, or relating to, or people/activities connected with McGill University. The collection consists of manuscripts, texts, photographs, audio-visual material, architectural records, cartographic materials, prints and drawings, microforms and artifacts. In 1962 F. Cyril James declared that the newly founded McGill University Archives (MUA), while concentrating on the institutional records of McGill, had the mandate to acquire private papers of former faculty members. In the 1990s drew back their acquisition scope and in 2004 new terms of reference on private acquisitions were introduced that included a wider McGill Community. The Redpath Museum houses collections of interest to ethnology, biology, paleontology, and mineralogy/geology. Built in 1882, the Redpath is the oldest building in Canada built specifically to be a museum. The McGill Medical Museum catalogues, preserves, conserves and displays collections that documents the study and practice of medicine at McGill University and its associated teaching hospitals. The Medical museum features collections, individual specimens, artifacts, equipment log books/autopsy journals/paper materials and medical instruments and apparati, 25 wax models, 200 mostly skeletal dry specimens; and 400 lantern slides of anatomic specimens. There is a special emphasis on pathology; there are 2000 fluid filled-preserved anatomical and pathological specimens. The Osler collection, for example consists of 60 wet specimens while The Abbott collection consists of 80 wet specimens, mostly examples of congenital cardiac disease. 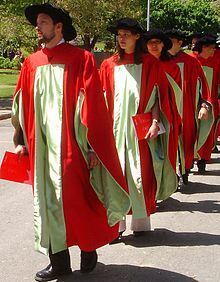 PhD candidates march at Commencement in McGill's distinctive scarlet regalia. McGill's student population includes 27,601 undergraduate and 10,144 graduate students representing diverse geographic and linguistic backgrounds. Of the entire student population, 54.7% are from Quebec and 25.4% are from the rest of Canada, while 20.0% are from outside of Canada (including the United States). International students hail from about 150 different countries, with Americans comprising about half of all international undergraduates and a third of all international postgraduates in the entering class of 2010. Almost half of McGill students claim a first language other than English. While the university is in a Francophone province, only 17.8% of the students claim French as their mother tongue, compared to 51.8% who claim English and 30.5% who claim some other language. In Fall 2018, 34,214 students were enrolled in full-time studies, while 5,822 students enrolled in part-time studies. The campus has an active students' society represented by the undergraduate Students' Society of McGill University (SSMU) and the Post-Graduate Students' Society of McGill University (PGSS). Due to the large postdoctoral student population, the PGSS also contains a semi-autonomous Association of Postdoctoral Fellows (APF). In addition, each faculty and department has its own student governing body, the largest faculty associations being the Arts Undergraduate Society (AUS) and the Science Undergraduate Society (SUS). The oldest is the Medical Students Society, founded in 1859. There are hundreds of clubs and student organizations at the university. Many of them are centred around McGill's student union building, the University Centre. There are student-run teams in the McConnell building such as the McGill Racing Team, McGill EV and McGill Baja. In 1992, students held a referendum which called for the University Centre to be named for actor and McGill alumnus William Shatner. The university administration refused to accept the name and did not attend the opening. Traditionally, the administration names buildings in honour of deceased members of the university community or for major benefactors—Shatner is neither. McGill has a number of student-run publications. The McGill Daily, first published in 1911, was previously published twice weekly, but shifted to a once-a-week publication schedule in September 2013 due to tightened budgets. The Délit français is the Daily's French-language counterpart. The combined circulation of both papers is over 28,000. The McGill Tribune currently publishes once a week, circulating approximately 11,000 copies across campus. The Bull & Bear, operating under the Management Undergraduate Society, publishes 1,000 copies each month. The satirical publication Plumber's Faucet and its counterpart Plumber's Legder (established in 2012) operate under the Engineering Undergraduate Society. Past publications include the Red Herring and the Plumber's Pot. CKUT (90.3 FM) is the campus radio station. TVMcGill is the University TV station, broadcasting on closed-circuit television and over the internet. The McGill University Faculty of Law is home to three student-run academic journals, including the world-renowned McGill Law Journal, founded in 1952. Other student-run journals include such publications as the McGill Journal of Law and Health, the McGill Journal of Medicine, and the McGill Journal of Education. While fraternities and sororities are not a large part of student life at McGill, some, including fraternities Zeta Psi, Delta Kappa Epsilon, Sigma Alpha Epsilon, Alpha Delta Phi, Alpha Epsilon Pi, Alpha Sigma Phi, Delta Lambda Phi, Kappa Alpha Society and Sigma Chi and sororities Gamma Phi Beta, Kappa Kappa Gamma, Kappa Alpha Theta, Alpha Phi and Alpha Omicron Pi have been established at the university. Phi Kappa Pi, Canada's only national fraternity, was founded at McGill and the University of Toronto in 1913 and continues to be active. With just over 2% of the student body population participating, involvement is below most American universities, but on par with most Canadian schools. Queer McGill (formerly Gay McGill) has supported lesbian, bisexual, gay, and transgender students since 1972. Many large organizations, including NGOs, have a local presence on campus. The International Relations Students Association of McGill (IRSAM) publishes the world's only all-inclusive international relations research journal, the McGill International Review and currently has consultative status with the UN's Economic and Social Council (ECOSOC) and the United Nations Educational, Scientific and Cultural Organization (UNESCO). Since 1990, IRSAM has hosted an annual Model United Nations, McMUN, for university students and since 1993 it has hosted an annual Model United Nations, SSUNS, for high school students. Other humanitarian groups represented at McGill include UNICEF, Oxfam, End Poverty Now, Right to Play, and Free the Children. McGill is represented in U Sports by the McGill Redmen (men's) and the McGill Martlets (women's). Following a major restructuring of the varsity programme for the fall semester of 2010, McGill is currently home to 28 varsity teams. McGill is known for its strong Baseball, hockey and lacrosse programs. McGill's unique mascot, Marty the Martlet, was introduced during the 2005 Homecoming game. The downtown McGill campus sport and exercise facilities include: the McGill Sports Centre (which includes the Tomlinson Fieldhouse and the Windsor Varsity Clinic), Molson Stadium, Memorial Pool, Tomlinson Hall, McConnell Arena, Forbes Field, many outdoor tennis courts and other extra-curricular arenas and faculties. The Macdonald Campus facilities, include an arena, a gymnasium, a pool, tennis courts, fitness centres and hundreds of acres of green space for regular use. The university's largest sporting venue, Molson Stadium, was constructed in 1914. Following an expansion project completed in 2010, it now seats just over 25,000, and is the current home field of the Montreal Alouettes. In 1868, the first recorded game of rugby in North America occurred in Montreal, between British army officers and McGill students, giving McGill the oldest university-affiliated rugby club in North America. Other McGill-originated sports evolved out of rugby rules: football, hockey, and basketball. The first game of North American football was played between McGill and Harvard on May 14, 1874, leading to the spread of American football throughout the Ivy League. 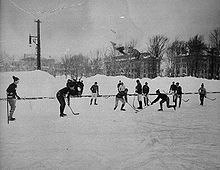 On March 3, 1875, the first organized indoor hockey game was played at Montreal's Victoria Skating Rink between two nine-player teams, including James Creighton and several McGill University students. 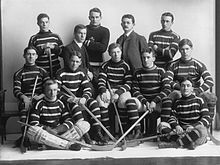 The McGill University Hockey Club, the first organized hockey club, was founded in 1877 and played its first game on January 31, 1877. Very soon thereafter, those McGill students wrote the first hockey rule book. A McGill team was one of four that competed in the Amateur Hockey Association of Canada, founded in 1886. AHAC teams competed for the first Stanley Cup in 1893; the AHAC became one of predecessor organizations of the National Hockey League. McGill alumnus James Naismith invented basketball in early December 1891. Norwegian Herman "Jackrabbit" Smith-Johannsen (later the coach of Canada's 1932 Olympic team) popularized cross-country skiing in North America from McGill's Gault Estate in Mont St. Hilaire. There has been a McGill alumnus or alumna competing at every Olympic Games since 1908. Swimmer George Hodgson won two gold medals at the 1912 Summer Olympics, ice hockey goaltender Kim St-Pierre won gold medals at the 2002 Winter Olympics and at the 2006 Winter Olympics. Other 2006 gold medalists are Jennifer Heil (women's freestyle mogul) and goaltender Charline Labonté (women's ice hockey). In 1996, the McGill Sports Hall of Fame was established to honour its best student athletes. Notable members of the Hall of Fame include James Naismith and Sydney Pierce. A 2005 hazing scandal forced the cancellation of the final two games in the McGill Redmen football season. In 2006, McGill's Senate approved a proposed anti-hazing policy to define forbidden initiation practices. In 2018, after a slew of protests—both online and on campus—an online vote revealed that 78.8 per cent of the McGill student population were in favour of changing the varsity teams' "Redmen" name, with 21 per cent against. 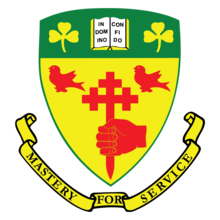 The university’s nickname emerged in the 1920s, and is thought to refer to the school’s signature colour and Celtic roots. In the 1950s, both men's and women's teams came to be nicknamed the "Indians" and "Squaws", and some teams later adopted a logo of an Indigenous man wearing a headdress in the 1980s and '90s. In December of 2018, McGill University released a working group report that revealed deep divisions between students and alumni who defend the nearly century-old name and those who feel it is derogatory to Indigenous students. In January of 2019, it was announced that the principal Suzanne Fortier will decide whether or not to change the name by the end of the 2019 academic term. The McGill University song book, compiled by a committee of graduates and undergraduates, was published in Montreal by W.F. Brown, circa 1896. McGill maintains an academic and athletic rivalry with Queen's University in Kingston, Ontario. Competition between rowing athletes at the two schools has inspired an annual boat race between the two universities in the spring of each year since 1997, inspired by the famous Oxford-Cambridge Boat Race. The football rivalry, which started in 1884, ended after Canadian university athletic divisions were re-organized in 2000; the Ontario-Quebec Intercollegiate Football Conference was divided into Ontario University Athletics and Quebec Student Sports Federation. The rivalry returned in 2002 when it transferred to the annual home-and-home hockey games between the two institutions. Queen's students refer to these matches as "Kill McGill" games, and usually show up in Montreal in atypically large numbers to cheer on the Queen's Golden Gaels hockey team. In 2007, McGill students arrived in bus-loads to cheer on the McGill Redmen, occupying a third of Queen's Jock Harty Arena. The school also competes in the annual "Old Four (IV)" soccer tournament, with Queen's University, the University of Toronto and the University of Western Ontario. McGill and Harvard are also athletic rivals, as demonstrated by the biennial Harvard-McGill rugby games, alternately played in Montreal and Cambridge. The University of Glasgow, one of four ancient Scottish universities and member of the British Russell Group. Founded in 1451, the original benefactor of McGill College, James McGill, studied here in the 1750s before his family worked as merchants in the city. The University of Edinburgh, one of four ancient Scottish universities and member of the British Russell Group. The University was founded as a civic institution in 1583 and has maintained a strong reputation in the study of medicine, among other disciplines. McGill's first (and, for several years, its only) faculty, Medicine, was founded by four physicians/surgeons who had trained in Edinburgh. For a more comprehensive list, see List of McGill University people. In the arts, McGill students include four Pulitzer Prize winners, Templeton and Berggruen Prize winner Charles Taylor, essayist and novelist John Ralston Saul, a Companion of the Order of Canada along with Charles Taylor, Juno Award winners Sam Roberts and Donald Steven, singer-songwriter Prita Chhabra and William Shatner, best known for his portrayal of Captain Kirk on Star Trek and winner of several Emmy Awards. Nine Academy Award winners studied at McGill. Poet and singer-songwriter Leonard Cohen majored in English at McGill and graduated in 1955. Composer and six-time Grammy award winner Burt Bacharach studied music at McGill, and Win Butler and Régine Chassagne of the Grammy Award winning group Arcade Fire met while studying at McGill. In the sciences, students include doctors, inventors, five astronauts (out of 14 total selected in the CSA's history) and scientist Mark J. Poznansky, a member of the Order of Canada. On October 16, 2009, the 42nd American president, Bill Clinton accepted an Honorary Doctorate from McGill University. 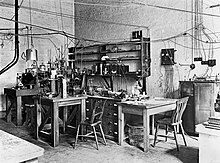 Dating back to 1908, McGill graduates and faculty have received a total of 12 Nobel Prizes in disciplines ranging from Physiology, Medecine, Economics, Chemistry and Physics. Some politicians and government officials both within Canada and abroad are McGill alumni, including three Canadian prime ministers, the incumbent Governor General of Canada, and 14 justices of the Supreme Court of Canada. Julie Payette, current Governor General of Canada, received her Bachelor of Engineering in 1986 before joining the Canadian Space Agency in June 1992. The engineer and 29th Governor General of Canada participated in two space missions, logging more than 25 days in space. Daniel Oduber Quirós earned his degree in philosophy at McGill in 1948 and became president of Costa Rica from 1974 to 1979. Vaira Vīķe-Freiberga completed her PhD at McGill and was elected as president of the Republic of Latvia in 1999, serving until 2007, as the first female president in Eastern Europe after Turkey's Tansu Çiller. Ahmed Nazif also completed a PhD at McGill in 1983 and has served as the youngest prime minister of Egypt since the republic's founding in 1953. Zbigniew Brzezinski, former United States National Security Advisor under President Jimmy Carter completed both his B.A. and M.A. degrees at McGill in 1949 and 1950, respectively. McGill students are also recognized as athletes, including various members of Canadian national teams and twenty-eight Olympic medalists. Since the Olympics began, McGill has produced 112 Olympians who have won a total of eight gold medals, nine silver, and eleven bronze. Professors at McGill have won 26 Prix du Québec, 14 Prix de l'Association francophone pour le savoir and 21 Killam Prizes. Twelve Nobel Laureates have studied or taught at McGill, among them Otto Hahn, who was awarded the 1944 Nobel Prize in Chemistry for his discovery of the nuclear fission of uranium and thorium. ^ These are McGill alumni Zbigniew Brzezinski and Edgar Bronfman Sr..
^ McGill alumni who have received Emmy Awards include Bob Arnot, Hume Cronyn, Roberto Hernández, Alex Herschlag, Simcha Jacobovici, Kevin Mambo, Jodie Martinson, Danny Redler, Alice Rhee, Abigail Tannebaum Sharon, William Shatner, Gail Simmons, Susan Farkas, Billy Wisse, David Wohl,and Richard L. Harrison. ^ "Mission, motto and coat of arms". About McGill. ^ "McGill University Quarterly Report on Endowment Performance" (PDF). Retrieved November 24, 2018. ^ "McGill University Budget Book FY2018" (PDF). McGill University. Retrieved November 24, 2018. ^ a b c "Faculty and staff". McGill University. Retrieved 2008-05-24. ^ a b c d e "Students" (PDF). McGill University. Retrieved 2018-11-24. ^ a b "Campus Planning". Retrieved 3 June 2015. ^ "Visual Identity Guide – Visual System". McGill University. Retrieved 2019-03-18. ^ "Association of American Universities". Aau.edu. Archived from the original on 2013-01-14. Retrieved 2012-11-05. ^ a b "McGill newsroom". Retrieved May 12, 2016. ^ a b "Admissions Profile". Macleans. 2013. Retrieved 2017-07-28. ^ a b "Enrolment Reports". McGill University. Retrieved 2010-04-26. ^ McDevitt, Neale (29 November 2018). "Taking the Rhodes less travelled". McGill Reporter. ^ "10 Points of Pride". ^ "McGill grad Jennifer Sidey becomes Canada's newest astronaut : McGill Reporter". publications.mcgill.ca. ^ a b "National Reporting". Pulitzer.org. 2018-04-16. Retrieved 2018-05-23. ^ a b "The 1997 Pulitzer Prize Winners". Pulitzer.org. 1944-10-04. Retrieved 2011-02-20. ^ "Artist – Vtape". www.vtape.org. ^ ""The History of the University" - University Archives Blog". archives.library.ubc.ca. ^ "History - University of Alberta". www.ualberta.ca. ^ "Our History - Schulich School of Medicine & Dentistry - Western University". www.schulich.uwo.ca. ^ "Moments that changed McGill". mcgillnews.mcgill.ca. ^ "The William Osler Papers: "Father of Modern Medicine": The Johns Hopkins School of Medicine, 1889-1905". profiles.nlm.nih.gov. ^ Edwards, Reginald. "Historical Background of the English-Language CEGEPs of Quebec". mje.mcgill.ca. ^ "An Act for the Establishment of Free Schools and the Advancement of Learning in this Province" (PDF). ^ "Education". McGill University Archives. Retrieved 2012-06-04. ^ "James McGill – Quebec History". Faculty.marianopolis.edu. Retrieved 2012-06-04. ^ Millman, Thomas R. "Mountain, Jacob". Retrieved 2008-06-08. ^ "History". McGill University General Information. 2007-03-08. ^ "The Gallery: James McGill's Will". McGill University Archives. 2003. ^ a b "Colleges A–M". Kipnotes.com. 2001. Archived from the original on February 24, 2012. Retrieved 2008-06-08. ^ a b "The Royal Charter of McGill University". Mcgill.ca. Retrieved 2012-06-04. ^ "Foundation History". McGill University. Retrieved 2012-06-04. ^ "The Gallery: 1821 Charter". McGill University Archives. 1940-05-17. Retrieved 2012-06-04. ^ Marco Polo. "Architectural Education". Thecanadianencyclopedia.com. Retrieved 2011-02-20. ^ "Spier, William". Dictionaryofarchitectsincanada.org. Retrieved 2012-06-04. ^ "Alexander Francis Dunlop". Dictionaryofarchitectsincanada.org. Retrieved 2012-06-04. ^ "Link to this page – Library and Archives Canada". Amicus.collectionscanada.gc.ca. Retrieved 2012-06-04. ^ "Biographic Dictionary of Architects in Canada 1800–1950 Andrew Taylor (Architect)". Dictionaryofarchitectsincanada.org. Archived from the original on 2012-04-25. Retrieved 2012-06-04. ^ "Jean Julien Perrault (architect)". Dictionaryofarchitectsincanada.org. Archived from the original on 2012-03-03. Retrieved 2012-06-04. ^ Michael Clarke. "William Dawson". Ccheritage.ca. Retrieved 2012-06-04. ^ "Royal Victoria College". McGill University Archives. 2004-03-24. Retrieved 2012-06-04. ^ "Our History: George S. Currie and George C. McDonald". PricewaterhouseCoopers Canada. Retrieved September 20, 2014. ^ "The Stained Glass War Memorials of Charles William Kelsey" (PDF). Retrieved 2012-06-04. ^ "McGill Chapter of Delta Upsilon Great War Memorial Window". Chief Military Personnel. Archived from the original on October 6, 2014. Retrieved September 20, 2014. ^ "McGill University remembers the Second World War". McGill University. 2013. Retrieved September 20, 2014. ^ "Museum of Jewish Montreal". imjm.ca. Retrieved 2017-02-16. ^ "Higher Education in British Columbia Before the Establishment of UBC – UBC Archives". Library.ubc.ca. Retrieved 2012-06-04. ^ "The Four Founding Physicians". Johns Hopkins Medicine. Retrieved 2014-08-27. ^ "Campus Maps". Mcgill.ca. Retrieved 2012-06-04. ^ "Study Places – McGill University". Educomp. 2008. Archived from the original on May 27, 2010. Retrieved October 5, 2014. ^ ""Brief history of Physics at McGill" – "McGill Physics", 2008". Physics.mcgill.ca. 2010-12-17. Archived from the original on 2012-09-06. Retrieved 2012-06-04. ^ David Johnson. "The Early Campus – Virtual McGill". Cac.mcgill.ca. Retrieved 2012-06-04. ^ David Johnson. ""Canadian Architecture Collection" – "Virtual McGill", 2001". Cac.mcgill.ca. Retrieved 2012-06-04. ^ "World's Most Beautiful Universities". Travel + Leisure. 2013-12-19. p. 3. Retrieved 2013-12-23. ^ "McGill Residences". Mcgill.ca. 2010-07-28. Retrieved 2011-09-29. ^ ""In the Ghetto", "McGill Reporter", September 9, 1999". Reporter-archive.mcgill.ca. Retrieved 2012-06-04. ^ " Upper Rez: Douglas, McConnell, Molson and Gardner Halls". "Moving into Residences" Archived 2008-04-16 at the Wayback Machine, "McGill University", 2008. Retrieved June 5, 2008. ^ "Percy Erskine Nobbs Biography". McGill John Bland Canadian Architecture Collection – The Architecture of Percy Erskine Nobbs. Retrieved 26 February 2014. ^ Morgan, Henry James, ed. (1903). Types of Canadian Women and of Women who are or have been Connected with Canada. Toronto: Williams Briggs. p. 1. ^ ""The MUHC Redevelopment Project", "McGill University Health Centre", 2008". Muhc.ca. Retrieved 2012-06-04. ^ a b "Sustainability". McGill University. Archived from the original on July 7, 2009. Retrieved 2009-06-05. ^ "Office of Sustainability: Campus Committees and GroupsSustainability". McGill University. Archived from the original on 2009-03-30. Retrieved 2009-06-05. ^ "Bellairs Research Institute, McGill University". Mcgill.ca. 2011-04-11. Retrieved 2012-06-04. ^ "HUNTSMAN MARINE SCIENCE CENTRE, McGill University". Biology.mcgill.ca. Archived from the original on 2011-10-01. Retrieved 2012-06-04. ^ ""Global Change Master Directory", Ocean Biogeographic Information System, February 19, 2008". Iobis.org. Archived from the original on January 19, 2010. Retrieved 2012-06-04. ^ "Huntsman Marine Science Centre, Huntsman Oceansciences". Huntsmanmarine.ca. Retrieved 2012-06-04. ^ "THE GAULT NATURE RESERVE, McGill University. Accessed May 3, 2008". Biology.mcgill.ca. Archived from the original on 2011-10-01. Retrieved 2012-06-04. ^ Research and education Archived 2017-09-07 at the Wayback Machine, McGill University. Accessed May 3, 2008. ^ "Mcgill University" Archived 2010-01-23 at the Wayback Machine, "Learnist.org Study Abroad", 2008. Accessed May 16, 2008. ^ a b c "Preliminary work under way on construction of the McGill University Faculty of Medicine's new campus in Outaouais : Med e-News". Retrieved 2019-02-11. ^ "Summit Park". Les amis de la montagne. Retrieved 21 May 2013. ^ "History – Desautels Faculty of Management – McGill University". www.mcgill.ca. ^ a b "Faculties and Schools – McGill University". McGill University. Retrieved 2014-10-11. ^ "Graduate and Postdoctoral Studies". McGill University. Retrieved 2008-03-16. ^ "Policy on use of the Wordmark and Insignia of McGill University" (PDF). Archived from the original (PDF) on 2015-02-26. Retrieved 2015-08-26. ^ "McGill Songs > McGill Facts and Institutional History > McGill History > Outreach". Archives.mcgill.ca. 2004-03-24. Retrieved 2011-02-20. ^ "About International Student Services (ISS)". McGill University. Retrieved 14 March 2019. ^ Tibbets, Janice. "U of T, UBC join billion-dollar club" Archived 2011-05-11 at the Wayback Machine, "Canwest News Service", February 3, 2008. Accessed May 4, 2008. ^ "MIP Quarterly Report on Performance" (PDF). McGill Office of Investments. June 30, 2018. Retrieved March 27, 2019. ^ "McGill launches $750-million fundraiser" Archived 2011-05-11 at the Wayback Machine, "The Montreal Gazette" October 18, 2007. Accessed May 4, 2008. ^ a b "History in the Making", "McGill Public and Media Newsroom", October 18, 2007. Accessed May 4, 2008. ^ "McGill launches largest Canadian university fundraising campaign" Archived 2010-12-05 at the Wayback Machine, "Academia Group Back Issues Database" October 19, 2007. Accessed May 4, 2008. ^ "Campaign McGill", McGill University. Accessed May 4, 2008. ^ "McGill University joins $1-billion fundraising club". Retrieved 19 June 2013. ^ "McGill University's fundraising tops $1 billion". Archived from the original on 21 June 2013. Retrieved 19 June 2013. ^ "McCall MacBain Foundation makes single-largest gift in Canadian history to create a flagship graduate scholarship program at McGill University". Newsroom. Retrieved 2019-02-13. ^ Gazette, The (2008-05-15). "McGill buys Anglican Diocesan Theological College". Canada.com. Archived from the original on 2012-08-22. Retrieved 2012-06-04. ^ "Bachelor of Theology Program". Mcgill.ca. Archived from the original on 2012-05-24. Retrieved 2012-06-04. ^ "Admissions Profile for Fall 2018 Admissions". ^ "Admissions Profile". McGill University. ^ "Frequently asked questions". Law Admissions. Retrieved 2018-06-23. ^ "Class Profiles". Office of Admissions. Retrieved 2018-06-23. ^ "Medical College Admissions Test® (MCAT®)". Office of Admissions. Retrieved 2018-06-23. ^ "FAQs". Desautels Faculty of Management. Retrieved 2018-06-23. ^ "Typical class profile". Desautels Faculty of Management. Retrieved 2018-06-23. ^ "Endowment Growth" (PDF). Retrieved 22 May 2015. ^ "McGill University". Princeton Review. Retrieved 22 May 2015. ^ a b "Student Accounts". Mcgill.ca. Retrieved 2015-04-22. ^ "Student Accounts – McGill University". Retrieved 3 June 2015. ^ "International Fee Exemption". Mcgill.ca. 2010-12-07. Archived from the original on 2011-02-10. Retrieved 2011-02-20. ^ Martin Patriquin. "McGill M.B.A. program goes private". Macleans.ca. Retrieved 3 June 2015. ^ "Admission Scholarships Program". "University of Ottawa". Archived from the original on May 18, 2008. Retrieved May 4, 2008. ^ "Entrance Scholarships". "Simon Fraser University". 2008. Archived from the original on April 17, 2008. Retrieved May 16, 2008. ^ "Entrance Awards". "University of Alberta". 2008. Retrieved May 16, 2008. ^ "Money Matters". "Mount Saint Allison University". 2008. Retrieved May 16, 2008. ^ "In-course awards – For students already at McGill". McGill University. Archived from the original on May 16, 2008. ^ "Dean's Honour List". McGill University. Archived from the original on May 16, 2008. ^ "Project Hero". Accc.ca. Archived from the original on January 13, 2010. Retrieved 2011-02-20. ^ a b "2017 Factbook". About McGill. Retrieved 2018-10-26. ^ "International Campus". The McGill Commitment. Retrieved 2018-09-30. ^ "" McGill français! " – Souvenirs – Les Archives de Radio-Canada". Archives.cbc.ca. Retrieved 2011-02-20. ^ "A reunion of radicals", "Reporter Volume 29 Number 2", September 26, 1996. Accessed May 16, 2008. ^ "Far from français"[permanent dead link], "The McGill Tribune", February 3, 2004. Accessed May 16, 2008. ^ "Reporter: McGill français". Reporter-archive.mcgill.ca. Retrieved 2011-02-20. ^ "Reporter: Kaleidoscope". Reporter-archive.mcgill.ca. Retrieved 2011-02-20. ^ Chester, Bronwyn. "McGill français and Quebec society". McGill Reporter, April 8, 1999. Retrieved January 20, 2006. ^ Provart, John. McGill français 30 years later. McGill News, Summer 1999. ^ "Top Universities by Reputation 2018". Times Higher Education. TES Global. 2018. Retrieved 14 July 2018. ^ "Graduate employability: top universities in Canada ranked by employers 2018". Times Higher Education. TES Global. 14 November 2018. Retrieved 21 November 2017. ^ "University Rankings 2019: Canada's top Medical/Doctoral schools – Macleans.ca". Macleans.ca. 2018-10-11. Retrieved 2018-11-18. ^ "McGill No.1 in Maclean's rankings for 14th straight year – McGill Reporter". McGill Reporter. 2018-10-11. Retrieved 2018-11-18. ^ "Best universities for graduate jobs: Global University Employability Ranking 2018". Times Higher Education (THE). 2018-11-14. Retrieved 2018-11-18. ^ "2018 tables: Institutions – academic | 2018 tables | Institutions – academic | Nature Index". www.natureindex.com. Retrieved 2018-06-23. ^ "Global University Leaders Forum 2015 Members List" (PDF). World Economic Forum. Retrieved August 11, 2015. ^ "CANADIAN UNIVERSITY REPORT". Retrieved 2018-11-18. ^ "Business school rankings and MBA rankings from the Financial Times". The Financial Times. Retrieved 4 May 2018. ^ "Business Schools ranking in Canada". Eduniversal-ranking.com. Retrieved 2018-06-22. ^ "Bloomberg Businessweek Best Business Schools 2017". BusinessWeek. ^ "Research Infosource Inc. :: Research University of the Year". researchinfosource.com. Retrieved 2018-11-18. ^ "Research Infosource Inc. :: Top 50 List". researchinfosource.com. Retrieved 2018-11-18. ^ "Canada's Top 50 Research Universities 2017" (PDF). ^ "Canada's Top 50 Research Universities 2017 – University Leaders by Tier" (PDF). ^ ""General Information" – "McGill Library"". Mcgill.ca. 2012-02-20. Archived from the original on May 14, 2012. Retrieved 2012-06-04. ^ George L. Parker. "University Presses". Thecanadianencyclopedia.com. Archived from the original on June 8, 2011. Retrieved 2011-02-20. ^ Gordon J, Maclean LD (1965). "A Lymphocyte-stimulating Factor produced in vitro". Nature 208: 795–796. doi:10.1038/208795a0. ^ "Alumni". Mcgill.ca. 2010-08-02. Archived from the original on April 11, 2006. Retrieved 2011-02-20. ^ "projects:prosthetic_instruments [Input Devices and Music Interaction Laboratory (IDMIL)]". 30 May 2015. Retrieved 3 June 2015. ^ "About Rare Books and Special Collections". McGill Library website. Retrieved 13 February 2014. ^ "About the University Archives". McGill University Archives website. Retrieved 13 February 2014. ^ Burr, Gordon (January 2006). "Private Holdings: Assessing the McGill University Archives' Role" (PDF). McGill University Archives. Retrieved 13 February 2014. ^ "McGill Medical Museum". 16 June 2013. Archived from the original on 16 June 2013. ^ "Enrolment reports". Enrolment Services. McGill University. Retrieved 2012-06-04. ^ "Introduction to McGill". McGill University. Retrieved 2011-07-02. ^ "Admissions Profile". McGill University. Archived from the original on 2011-07-06. Retrieved 2011-07-02. ^ "Students". McGill University. Retrieved 2011-07-02. ^ "About | Science Undergraduate Society of McGill". sus.mcgill.ca. Retrieved 2015-11-29. ^ "About the AUS". Arts Undergraduate Society of McGill University. 2015-07-02. Retrieved 2015-11-29. ^ "Medical Students' Society of McGill University (MSS) | Medical & Dental Student Gateway of McGill University". mcgillmed.com. Retrieved 2015-11-29. ^ a b "About The McGill Daily" Archived 2009-01-15 at the Wayback Machine, The McGill Daily, 2008. Retrieved June 13, 2008. ^ Student newspapers adapt to drop in advertising – Maclean's On Campus Archived 2013-09-21 at the Wayback Machine. Oncampus.macleans.ca (2013-08-01). Retrieved on 2013-12-23. ^ "TVMcGill". TVMcGill. Archived from the original on 2011-02-17. Retrieved 2011-02-20. ^ "McGill Law Journal". Lawjournal.mcgill.ca. Retrieved 2015-08-12. ^ "Our Chapter". AEPi EX. Archived from the original on 28 September 2015. Retrieved 3 June 2015. ^ "Greek Row: Fraternity participation up, sororities down" Archived 2008-03-19 at the Wayback Machine The Daily Utah Chronicle, November 7, 2007. Accessed May 3, 2008. ^ "Centre de recherches sur les pâtes et papiers de l'Université de McGill", "Mémoire du monde", UNESCO.ORG. Accessed May 3, 2008. ^ "McGill Redmen, College Men's Lacrosse 2015 – LaxPower". www.laxpower.com. ^ "Quick Facts" Archived 2011-01-20 at the Wayback Machine, "McGill Athletics", 2011. Accessed May 24, 2012. ^ Sharma, Mira. "CAMPUS: Marty the Martlet turns one"[permanent dead link], "The McGill Tribune" September 26, 2006. Accessed May 5, 2008. ^ Thompson, Tom et al. "McGill Track and Field History" Archived 2007-06-09 at the Wayback Machine, "McGill Athletics History", December 19, 2003. Accessed May 16, 2008. ^ "Facilities" Archived 2008-05-12 at the Wayback Machine, "McGill Athletics", 2003. Accessed May 16, 2008. ^ "Welcome to Macdonald Campus Athletics" Archived 2008-05-12 at the Wayback Machine, "Macdonald Campus Athletics", 2008. Accessed May 16, 2008. ^ The Canadian Press (June 20, 2010). "'Als' well in Montreal in pre-season win". Canadian Football League. Archived from the original on December 2, 2010. Retrieved January 7, 2011. 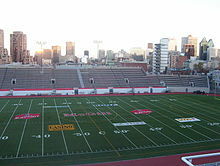 ^ "Molson Stadium" Archived 2008-04-27 at the Wayback Machine, "McGill Athletics", 2008. Accessed May 17, 2008. ^ "McGill Redmen GAME NOTES for Ottawa & Clarkson – UPCOMING MILESTONE"[permanent dead link], "McGill Athletics" January 5, 2007. Accessed May 4, 2008. ^ Doug Lennox (31 August 2009). Now You Know Big Book of Sports. Dundurn Press Ltd. pp. 12–. ISBN 978-1-55488-454-4. Retrieved 10 June 2011. ^ "McGill send 27 to 2004 Athens Summer Olympics", "McGill Athletics", August 13, 2004. Accessed May 16, 2008. ^ "2004 inductees to McGill Sports Hall of Fame"[permanent dead link], "McGill Athletics", June 24, 2004. Accessed May 16, 2008. ^ Curtis, Christopher (November 13, 2018). "McGill students vote overwhelmingly to change 'Redmen' name in non-binding referendum". Montreal Gazette. Retrieved March 27, 2019. ^ Deer, Jessica (January 30, 2019). "McGill to make decision on Redmen name by end of academic term". CBC News. Retrieved March 27, 2019. ^ "McGill University drops Redmen name from sports teams, cites pain caused to Indigenous students". Toronto Star. 12 April 2019. Retrieved 13 April 2019. ^ "AMICUS Web Full Record – AMICUS – Library and Archives Canada". Collectionscanada.gc.ca. Retrieved 2012-06-04. ^ Weston, Greg (27 May 2008). "Rowers reel in McGill". Queen's Journal. Retrieved 5 August 2014. ^ Busing, Hillary (19 September 2000). "McGill Rivalry Ends". Queen's Journal. Retrieved 5 August 2014. ^ Vertlieb, Dan (19 September 2000). "Gaels fail to 'Kill McGill'". Queen's Journal. 128 (7). Retrieved 5 August 2014. ^ Bucholtz, Andrew (23 November 2007). "A bitter pill from McGill". Queen's Journal. 135 (22). Retrieved 5 August 2014. ^ "U of T Soccer to Host Old Four Tournament". Retrieved 2008-09-02. [permanent dead link] "The University of Toronto Varsity Blues soccer program is proud to host a very time-honoured tradition – the annual Old Four tournament, August 30–31, 2008 at the Varsity Centre. This tournament features the original four football schools in Canadian university sport: McGill University, Queen’s University, the University of Western Ontario and the University of Toronto." ^ "Ruggers Set For Rivalry; McGill Comes to Town". 30 October 1987. Retrieved 5 August 2014. ^ "University of Glasgow :: International students :: In your country :: Canada". Gla.ac.uk. Retrieved 2012-06-04. ^ Cooper, J. I. (1983). "McGill, James". In Halpenny, Francess G (ed.). Dictionary of Canadian Biography. V (1801–1820) (online ed.). University of Toronto Press. ^ "Brief history of Medicine at McGill". Archived from the original on May 29, 2010. Retrieved April 19, 2011. ^ Murphy, Mike. "Charles Taylor awarded Templeton". Mcgill.ca. Retrieved 2011-02-20. ^ "Alumni". Mcgill.ca. 2010-05-20. Retrieved 2011-02-20. ^ Eder, Bruce. "Leonard Cohen biography". allmusic.com. Retrieved April 1, 2014. ^ "McGillians set the music world on fire – McGill Alumni Portal". Archived from the original on 30 April 2014. Retrieved 3 June 2015. ^ "McGill grad Jennifer Sidey becomes Canada's newest astronaut : McGill Reporter". publications.mcgill.ca. Retrieved 2018-06-23. ^ "Congratulations to the latest Order of Canada appointees!". Canadian Institutes of Health Research. Archived from the original on December 18, 2005. ^ "CBC News – Montreal – Bill Clinton given honorary McGill doctorate". Cbc.ca. 2009-10-16. Archived from the original on October 20, 2009. Retrieved 2010-02-22. ^ "McGill University Alumni". Mcgill.ca. 2010-08-02. Archived from the original on April 11, 2006. Retrieved 2011-02-20. ^ "Hockey Olympians add three golds to McGill total : McGill Reporter". Publications.mcgill.ca. 2010-02-26. Retrieved 2011-02-20. Axelrod, Paul. "McGill University on the Landscape of Canadian Higher Education: Historical Reflections." Higher Education Perspectives 1 (1996–97). Coleman, Brian. "McGill, British Columbia." McGill Journal of Education 6, no. 2 (Autumn 1976). Collard, Andrew. The McGill You Knew: An Anthology of Memories, 1920–1960. Toronto: Longman Canada, 1975. Frost, Stanley B. 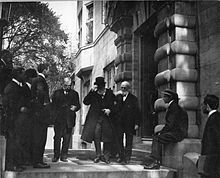 The History of McGill in Relation to the Social, Economic and Cultural Aspects of Montreal and Quebec (Montreal: McGill University. 1979). Gillett, Margaret. We Walked Very Warily: A History of Women at McGill. Montreal: Eden Press, 1981. Hanaway, Joseph; Richard L. Cruess; James Darragh (1996). McGill Medicine: Vol. 1 1829–1885 and Vol. 2 1885–1936. McGill-Queen's University Press. ISBN 0-7735-2958-6. Wikimedia Commons has media related to McGill University. Scholia has an organization profile for McGill University.